(UPI) — For the second time since taking office, President Donald Trump spoke at the annual National Prayer Breakfast in Washington Thursday, continuing a tradition that stretches back more than a half-century. More than 3,500 people, including members of Congress, attended the 66th annual event at the Washington Hilton Hotel. Trump discussed the role of faith as lawmakers and political leaders deal with a variety of issues, including immigration, the opioid epidemic and North Korea. He also boasted that U.S. forces had liberated almost all territory formerly occupied by the Islamic State terror group, which also goes by the acronym ISIS. “For years, ISIS had brutally tortured and murdered Christians, Jews, religious minorities, and countless Muslims,” Trump said. Rep. Steve Scalise, the Louisiana congressman who was shot last year during a Republican baseball practice, served as the keynote speaker for the breakfast — replacing Vice President Mike Pence, who is in Pyeongchang, South Korea, for the Olympics opening ceremony. Each year, the breakfast is organized by the Fellowship Foundation, a religious organization that aims to unite business, political and religious leaders. The annual event began in 1953 when lawmakers asked former President Dwight Eisenhower to join them for breakfast “in the spirit of Jesus.” Every president since Eisenhower has spoken at the annual breakfast. Last year, Trump attended the 65th annual breakfast just weeks after his inauguration. In my prayers, I thank God every day that we have President Trump in office [and not anyone else]. Donald Trump was the answer to an entire nation praying very hard to be spared from Queen Hillary. You know she wouldn’t have been a President. She wanted to sit on the Iron Throne. The Lord God showed mercy and answered our plea. Remember on election night when she thought she was going to win? 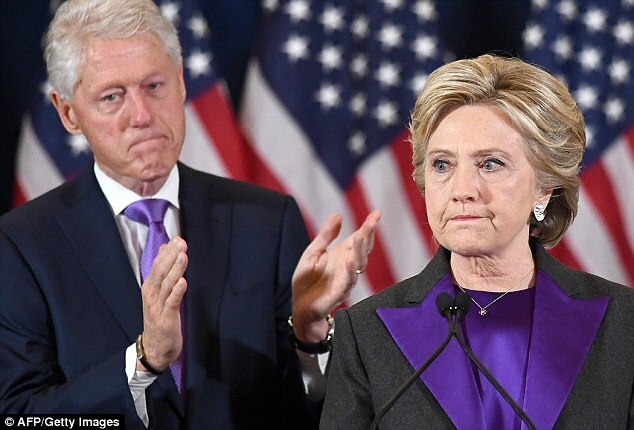 She and Bill wore PURPLE to the coronation ceremony. Purple is the color of royalty. This was no accident or coincidence. This was the start of the whole purple tie thing we see to this day. They were signalling their intentions to transform America from a Republic into a Monarchy (Dictatorship). Neither of them has ever been a fan of the Constitution. I’m sure they would have called it New Camelot, but in practice it would have been something much different. tws500, I agree with your comments whole heartedly. Thank God for Trump! Just awesome. This president knows what to do to be successful. Pray to God through Jesus Christ. America is back on the right track for a change after eight years of idolatry and bashing Christianity.